A second before I opened the door to the First Watch Café, I caught the intoxicating scent of bacon. A second after I opened the door, I heard a chirpy “Happy Sunday!” from the greeter. Those few seconds pretty much sum up everything I took away from my first visit to the new “daytime café” in Mequon. On the one hand, the food was quite good and the service was excellent. On the other hand, the atmosphere was so tightly packaged that I felt a little uneasy. It was so clean and organized and orchestrated, it felt like I entered a Stepford-style Applebee’s. A sterilized George Webb. A Disney Does Donuts. Now let’s make this clear. I had a nice breakfast with great service in a very clean, happy neighborhood restaurant. That’s all good. The whole fresh-faced waitstaff, which at the time appeared to easily outnumber the clientele, was welcoming and helpful. The breakfast menu was diverse, featuring a lot of “eggs-clusives” with a pseudo-Mexican theme. Avocados were everywhere. Yet First Watch feels like it exists in its own suburban universe, one where Mexico never existed. So I traveled elsewhere and ordered the Eggs Benedict Florentine. It arrived quickly and featured sliced avocado (of course), tender spinach leaves, tomato and perfectly prepared eggs. The hollandaise was acceptable, but the muffins were a bit soft and soggy. No problem, though. Overall, the flavors were good, the side potatoes were fine and the meal was satisfying. For an easy, fast, reliable breakfast, I’ll go back to First Watch. I’ll even recommend it, sort of. But I’ll be hoping that it grows a personality beyond a chirpy chain that feels more Brookfield than Mequon. 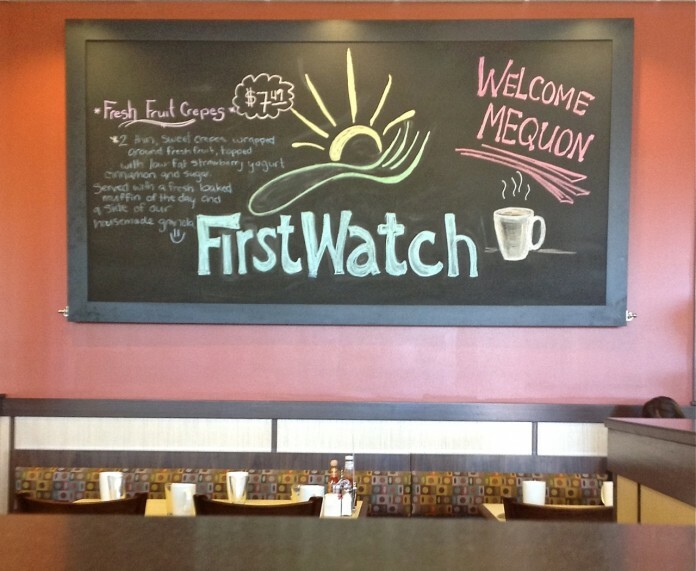 On TMN’s 20-Star Scale, First Watch Mequon gets 11 stars. The good. Happy, clean, scrubbed tables, staff and atmosphere. Even the flatware was spotless and perfectly balanced. The bad. The full carafe of coffee came quickly – but their morning blend was a bit weak and slightly sour to our taste. Required c. and s. to pull it through. The ugly. Large oil paintings of fruit cover the walls, adding colorful but slightly creepy turbulence. The peaches look disturbingly like large, shaved buttocks.